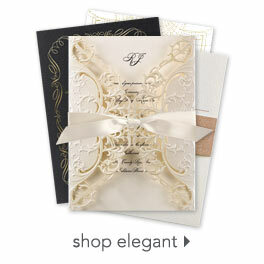 Add beautiful detail to your wedding invitation ensemble quickly and easily with these gold shimmer, laser cut envelope liners. The flowers and lace design is a gorgeous complement to any ensemble. Includes one glue dot for securing inside your envelope. Liners may be used on envelopes measuring 5 3/4" x 7 15/16" up to 8 3/16" x 6". Envelopes are sold separately. Size: 7 1/8" x 7 11/16"
If ordered today, we estimate your order will be ready for shipment on Tuesday, May 07.